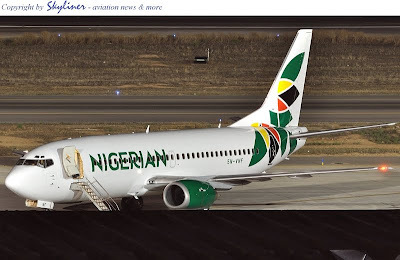 I can't help feeling that there was some very poor branding thinking going into the decision to change Virgin Nigeria's name to Nigerian Eagle Airlines in advance of the Branson pull-out. Its eight syllables long for one thing. Airlines are better named with short two syllable names - Aero, Dana, Arik all pass the simple to remember, simple to say test. A much better idea would have been simply to call it Eagle Air. Everyone would have got the reference to the Nigerian Eagle association. Eagle Air has a much better ring to it than Nigerian Eagle Airlines, don't you think? I guess they put "Nigerian" in to assume the role of "national carrier". But isn't that an outdated concept these days? So who do I write the invoice to? At first when i saw the title, i was like, "Is Nigerian airways finally being awaken from its 200year slumber"? Not digging the name thou. Like the Eagle Air idea, sounds classy, u knw, an arabic feel, think GOLD! This is simply unbelievable, what an ugly name. I actually don't think the "NIGERIAN" part sounds overly nationalist at all, in fact many of the most respected airlines around the world are named after their countries and are fully profitable and privately owned. Think: Thai, Emirates, Singapore Airlines, British Airways, Ethopian, Kenya, etc. Marketing is not about the brand name but about how to position the brand into the consummer's mind. To a large extent the success or otherwise of this rebranding exercise will depend on how well they deliver on their promises of excellent service. Think punctuality, food quality, inflight entertainment which they have started offering even on domestic runs, young fleet age, etc. I say give NEA a chance and let's give them a year and see how they actually BUILD this new brand. PS. i was never big on the EAGLE part of the name because it brings back memories of the corrupt deal the former aviation minister was involved in to float a national airline. That was back in 2003. But practically speaking the EAGLE word does relate to Nigeria and many Nigerians relate to it. It's present on the nigerian coat of arms, football team, etc. So the Virgin name is gone. Pity. Next time, I'll fly Aero. Something about Nigerian Eagle doesn't do it for me. There's nothing really wrong with the new name, although it would not have been my own first choice. However, more than a mere name change, VNA/Eagle needs a total re-branding anchored on a revamp of its quite atrocious services and customer relations. preferably Naija Air or Eagle Air sounds pro. The colour should be minimized too. sebi there's still british airways or is it airline sef ? Nigerian Eagle o, virgin o, we got incompetence par excellence calling the shot so it doesnt matter.